Discussion in 'Pictures & Stories of My Chickens' started by lizrndiver, Aug 9, 2009. Now that I have acquired a family for the BR pullet that adopted us. I figured it's time to share some photos. 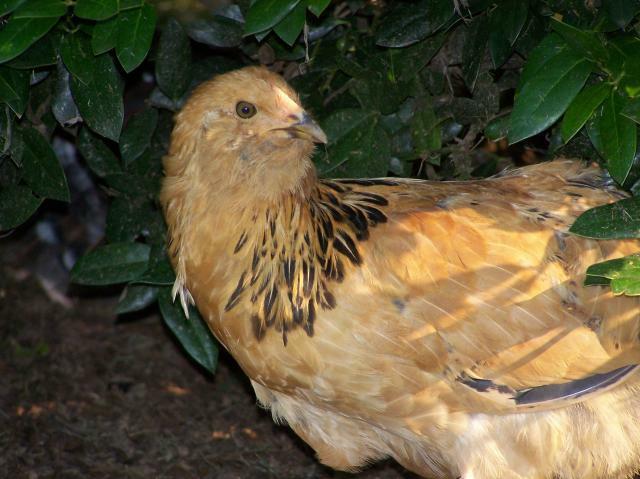 First there is CiCi the BR pullet we estimate at 14 or 15 weeks. She was hand raised before coming to us. She is having the hardest time adapting to her new family since she has only lived with people. She spends a lot of time hiding in the corner of the run. The bonus is she is the only one who know that "here chick chick" means hand fed grapes. Her favorite. Everyone else still ignores me. Next is the big boss lady. She is Gold Laced Wyandotte that is 20 weeks old. We don't have a name for yet. Any ideas? 2nd in the pecking order is our 16 week old Red Sussex. She doesn't have a name yet either. She is actually the meaner to the BR and little Peach than the Wyandotte. Maybe she is upset to be number 2. Here is little Peach. She is an 11 week old Buff Sussex. Very sweet and purrs if you pet her. She occasionally squeaks out a little chick noise if she is really getting picked on. CiCi and her like to roost together in one of the nest boxes. Safety in numbers? Anyway...we thought our BR was older until I started getting her friends. I had just a few local pullets to chose from so we got a range of ages and breeds and figured no one knew each other so they would all sort it out. And oh my goodness!! I think Peach is my Beth's twin!! Although Beth is an EE. I think Goldie is a pretty name. Nice chickens. Since you have a peach how about a apricot for number 2. CiCi is a Dominique, not a Barred Rock, which is way better in my opinion. ETA: The "big boss lady" has the wrong type comb to be a Wyandotte. I'm not exactly sure what she is, but she is still pretty! names?? I'll post my chicken's names and then extras. Quote:Big Boss Lady is a single comb Wyandott which is very common with hatchery birds. CICI is a barred rock also. She is a young one but her barring is very clear and correct. If she was a dominique it would be broken and muddy.